BBC One’s topical magazine show The One Show broadcast a lovely feature about Elisabeth Beresford, the creator and author of The Wombles, on 10 November. The five-minute film was presented by Elisabeth Beresford’s son, Marcus Robertson, reminiscing about his childhood as part of a series in which the children of famous parents talk about what it was like growing up with them. Marcus began with the legendary tale of his family’s Boxing Day walk on Wimbledon Common in the 1960s, before they moved to Alderney. He talked about how his mother loved the island life in a small, friendly community, and then he showed us her house. The “parlour” was the room where she wrote all her books, on a typewriter which she called her “tryper”. The door is still covered with children’s drawings of Wombles, and the shelves are full of Wombles books and cuddly toys. Marcus also remembered how excited his mother was when she got her OBE at Buckingham Palace, and how the Queen knew a lot about the Wombles and was “clearly a Wombles fan”. The film, which you can watch below, included some nice archive photos and interview footage of the young Elisabeth Beresford. Interesting that Marcus went to Waterloo Station as a child to look at the trains. Was this the genesis of “Wellington Goes To Waterloo” wherein young Wellington engages in a bit of trainspotting? Mike Batt’s witty lyrics/title exploited the connection of the Duke of Wellington with the Battle of Waterloo. Otherwise the song might have been titled “Orinoco Goes To Waterloo” which would not have been so plausible since Orinoco would have taken the opportunity of a day off to catch up on his 40 winks! But there is also a short story in the Wombles Gift Book titled Wellington Almost Meets His Waterloo – was it inspired by or the inspiration for the song? Waterloo Station also served as the inspiration for one of the Kinks’ finest songs – Waterloo Sunset – whose music and vocal arrangements must certainly have influenced Mike Batt when he wrote the Wombles’ music. 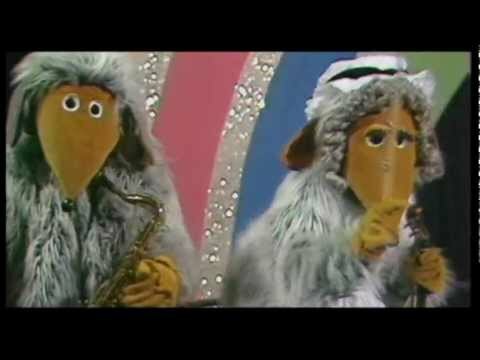 And, of course, there’s a nod to the Kinks’ song title in the Wombles’ song Wimbledon Sunset. @TidyBag Oh bless him! My friend used to work with Marcus – such a super chap!